I am thrilled to announce the publication of my first children’s book I SEA. I have been honored to team up with my talented friend Kirsti Scott, who did the photography and design and whose company Etched by the Sea, also the publisher of Beachcombing magazine, published the book. In our new children’s book I Sea, readers are challenged to find hidden beach treasures. 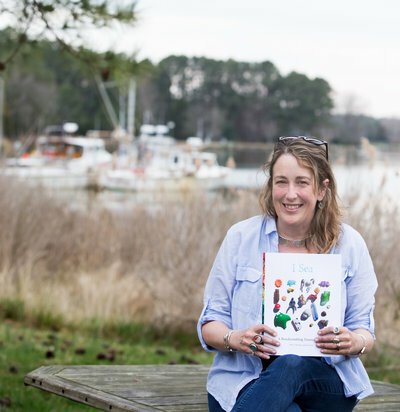 Channeling my inner Dr. Seuss, the pages are filled with riddles, and photos of colorful marine debris, mostly finds of mine and some from beaches around the world, providing fun for beachcombers of all ages. I Sea is dedicated to beachcombers worldwide who pick up not only the treasures on our shorelines, but also the trash. We hope that looking for the hidden beach trash and treasures inspires readers to continue to find and pick up treasures on their own beaches. Eight million tons of plastic are dumped into our oceans each year, and while only a fraction washes up on beaches, beachcombers have the opportunity while on the beach to pick up man-made materials so they don’t harm marine life. A portion of the proceeds of the book are being donated to ocean conservation. The book will appear for the first time at the “Beach Finds of the Chesapeake” exhibit at the Eastern Shore Sea Glass Festival April 5-7 at the Chesapeake Bay Maritime Museum in St. Michaels (cbmm.org) where I will be lecturing, doing sea glass identification and judging a beach finds contest. I will have a limited number of copies available for signing. (Learn more about the festival at seaglassfestival.com.) The book is available online at etchedbythesea.com.